We are delighted to be able to offer you this brand new limited edition Carbon Shine Anniversary V7 III. Fantastic ride, awesome old school looks and all the fun of the fair. Low rate finance is available on this bike, credit subject to acceptance. Moto Guzzi's Limited Edition Anniversary model V7 III. Brand New, 24 months warranty and 12 months RFL. An exclusive limited edition version in just 500 numbered units, the V7 III Limited combines the classic and elegant chromium look with refined hi-tech materials such as carbon fibre and aluminium . This is an eclectic and modern look that reiterates how well the V7 III lends itself to customization, an extremely youthful bike but at the same time a 'Made in Italy' symbol, popular with a transversal and diverse public. On the Moto Guzzi V7 III Limited, the numerous chromium plated parts are reminiscent of the purest Classic world, beginning with the chromium fuel tank, “wrapped” on the top under a black leather vintage-look strap . On the sides, the unmistakeable Moto Guzzi eagle is done in a particular burnished finish : after all, black is another recurring element on the V7 III Limited, from the alloy wheels to the saddle with “old school” stitching, as well as the typical pattern of carbon fibre, the material used for the front and rear fenders and the side panels . The locking fuel cap is made from billet aluminium, as are the handlebar risers which bear the model's laser inscribed serial number. 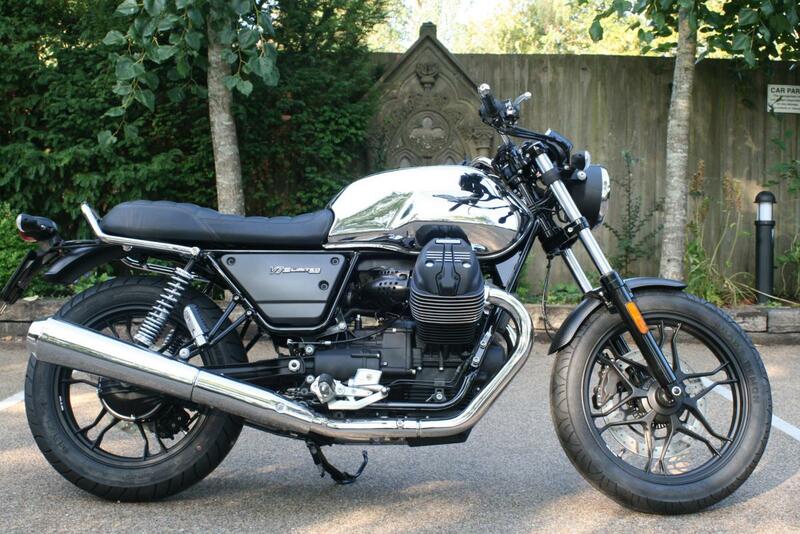 The Moto Guzzi 750 twin-cylinder also has a refined look, with the throttle body covers made of black anodised aluminium and the cylinder heads with milled cooling fins that create another contrasting effect. The essential instrumentation is a single, circular display with analogue speedometer and the other information contained on a digital display. Low Rate Finance is available on this bike, credit subject to acceptance. For a no obligation Finance Quote please call, 01747 811196 and select option 1 for sales. Thanks for looking! !